Google is really a technology giant that stood beside people around the world by helping them. They revolutionalised the Virtual Reality by launching Cardboard, a very cheap VR headset. Now they have launched their new VR venture which they named as Daydream. 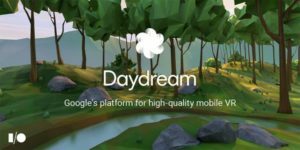 Daydream is the name for new VR creativity from Google. Google Daydream Apps is not only a VR headset launched from Google but it is just something other than that. Daydream is an entire system that is integrated with hardware specifics supporting VR experience, combined with new interface, regulators and also developer tools. If you are expecting Daydream to be an independent VR headset just like Oculus Rift or Vive from HTC, then you may be disappointed. It should be backed by your smartphone like GearVR or Cardboard. But here also you may get disheartened since not every smartphone supports Daydream. Only those smartphones that are going to be launched in future with Android N will support Daydream. Other features include that this handset must be powered by high end processor that can deliver better experience @60fps along with a low continued display that too OLED only supported by high quality sensors. Daydream will function on those smartphones which can provide motion-to-photon latency up to 20ms. Daydream has got the support of Android N. Android N is packed with all the APIs, head tracing algorithms, other developer tools, low persistence and low latency VR mode. This ensures that you need not have to download any secondary application to run Daydream. So this all clear the fact that Daydream will function only in those smartphones that are going to be launched with Android N as their OS. That’s why we have to wait until new smartphones loaded with Android N to launch to the markets in order to see Daydream. In order to use Daydream you may need to have Custom VR controller from Google. This controller has got a clickable touchpad which can sense motion and orientation along with two buttons along with thumb trackpad. In these one can be used by apps and other is solely meant for system functions. Without this controller you will not be able to enjoy Daydream VR. Thus this control device is designed to provide the users an opportunity to enjoy the experience of VR world and at the same time provide a controller spec for developers. Just place a VR headset and load Daydream on compatible smartphone, then you will see yourself in the midst of a cartoonish forest. This is your Daydream Home. There you are allowed to get into various other applications, VR video and also notifications related to promotion of new contents. There you are also allowed to search in Google Play’s own VR store. You are also allowed to search as well as download contents even if you don’t have a VR headset. Likewise Expedition by Google is really an education centered VR project targeted on students to travel in Virtual world with the guidance of a teacher. Bavor who is the head of Google’s VR project said that they will be integrating Google Play Movies, Street View and Google Photos also with Daydream. He also pointed that they transformed YouTube to be compatible with VR. Daydream enabled handsets will be premium built with improved 4K display along with Android N. Also the Google Controller and VR headset will cost you extra. This makes Daydream VR experience quite costlier. Also only next generation smartphones can support Daydream. So we may be required to wait until smartphones to have Android N in it.